Sonos PLAYBAR on sale! Sonos BEAM on sale! Sonos SUB on sale!!!!!!!!! Sonos PLAYBAR premium soundbar: Normally $699…NOW $599! Sonos PLAYBASE television base speaker: Normally $699…NOW $599! Sonos BEAM soundbar speaker: Normally $399…NOW $349! Sonos SUB subwoofer unit: Normally $699…NOW $599! Sonos is the world’s (and our) favorite streaming speaker. Here’s some more information about how Sonos can enhance your life (see link below for an archive of Sonos information and articles). Interested in Sonos speakers and saving $$$? Give us a call and let us give you the gift of Sonos for Superbowlmas! San Diego Sonos sale! Our dealers proudly serve all of San Diego, CA which includes Del Cerro, Allied Gardens, Talmadge, Kensington, Hillcrest, Mission Valley, Fashion Valley, El Cajon, Blossom Valley, La Mesa, Lake Murray, Friars, North Park, Balboa Park, Clairemont, Kearny Mesa, Mission Bay, Mission Beach, Pacific Beach, Ocean Beach, Imperial Beach, Pt Loma and Downtown San Diego. We also gladly serve those in North San Diego, California which includes Carlsbad, San Marcos, Vista, Alta Del Mar, Elfin Forest, Oceanside, Escondido, Encinitas, Cardiff by the Sea, Solana Beach, Del Mar, Alta Del Mar, Rancho Santa Fe, 4S Ranch, Santaluz, La Jolla, Poway, and Rancho Bernardo. Need help in Murrieta, Wildomar, Temecula, Fallbrook or Bonsall...we're there too. Sonos Beam vs. Sonos Playbar - Which Sonos soundbar is best? The Sonos BEAM sells for $399.00 vs. $699.00 for the Sonos PLAYBAR. Benefit $$$! The Sonos BEAM has Alexa built-into the soundbar. This allows you to operate many functions with just your voice! Better Sound: The Playbar uses 9 built-in speakers vs. 5 built-in speakers for the Beam. This allows the Playbar to provide fuller sound and audio that fills up a room. Cleaner mounting: The Sonos Playbar can be mounted vertically or horizontally. This makes for a much cleaner look when it is mounted under a TV as it doesn't protrude as far from the wall. The Sonos Beam will stick out substantially past the wall-mounted TV in most cases. If you want an aesthetic and subtle look, the Playbar is our recommendation. Hook-up Method: The Sonos Playbar uses what is called an optical cable to provide the audio channels. The Sonos Beam uses an HDMI cable and relies on a technology called ARC (audio return channel). Guys like us hate ARC as it isn't as reliable as we'd like. This lack of reliability can cause things to turn off that shouldn't, can cause components to go to the wrong input, etc. For better reliability and ease-of-use, we recommend the Playbar. We are BIG fans of the Playbar over the Beam. However, they both have their place. Choose the Playbar if you have a large room, want BETTER sound or a clean look when wall-mounted. Choose the Beam if you are on a budget or if you want to get better sound in secondary areas such as Guest Bedrooms, Kids' Rooms, etc. Need help deciding? We've helped hundreds of clients with Sonos in their San Diego homes. Let us help you as well! Sonos ONE 2 room set: Reg. $398.00. NOW $379.00! Sonos PLAY5 2 room set: Reg. $998. NOW $949.00! Sonos ONE 3 room set: Reg. $597.00. NOW $549.00! Sonos 5.1 surround system with PLAYBAR, SUB and ONE X 2 units: Reg. $1796.00. NOW: $1678.00! Sonos 5.1 surround system with BASE, SUB and ONE X 2 units: Reg. $1796.00. NOW: $1678.00! Sonos PLAY5 AND Pro-ject Essential III turntable: Reg. $858.00. NOW: $799.00! Not sure what Sonos or pro-ject turntables are all abouot? See our earlier posts about these fantastic music streamers and wonderful turntables. These sales is for a limited time so when Sonos says "No More", this Sonos Speaker Sets deal is officially over. Interested? Give us a call and let San Diego's Sonos dealer of choice show you why Sonos is a need for every music lover. Want to install a Sonos wall mounted speaker...read on! Sonos speakers are great but in the past, there hasn't been a way to cleanly wall mount them. The problem is that legally, we can't run the power cables in the wall (against California code) so you would see them laying exposed on the wall. However, one of our installation partners just came up with a solution. Midlite now has a LEGAL in-wall power solution that allows us to hide the power cable and that doubles as a wall mount! This makes for a much cleaner look, especially when using Sonos speakers as rear speakers in a surround sound configuration. Looking for Sonos speakers? We happen to be Sonos experts and carry the full line including the PLAYBAR, Sonos ONE, Sonos SUB, Sonos PLAY5 and others. Don't know what all the ruckus is about? See below for a little information of what Sonos is all about. Interested? Give us a call and let us show you how to enhance your life with Sonos streaming speakers and amazing music. Ready for some rocking tunes for the Holidays? Sonos has just let us know about some of their "Black Friday" deals. These specials actually start on 11/23 and go through 11/27. During this limited time, we'll be offering deals on a number of Sonos items. Interested? The best bet is to contact us before the sale, have us reserve the pieces for you and then we can ring them up any time between the 23rd and the 27th. Here's some of the specials. Don't miss out on having GREAT sound and being able to save some bucks! Call San Diego's Black Friday Sonos specialists for information and for FUN. Better audio, video and home automation from your friends at Aire Theater Designs. San Diego Black Friday 2017 Sonos dealers proudly serve all of San Diego, CA which includes Del Cerro, Allied Gardens, Talmadge, Kensington, Hillcrest, Mission Valley, Fashion Valley, El Cajon, Blossom Valley, La Mesa, Lake Murray, Friars, North Park, Balboa Park, Clairemont, Kearny Mesa, Mission Bay, Mission Beach, Pacific Beach, Ocean Beach, Imperial Beach, Pt Loma and Downtown San Diego. We also gladly serve those in North San Diego, California which includes Carlsbad, San Marcos, Vista, Alta Del Mar, Elfin Forest, Oceanside, Escondido, Encinitas, Cardiff by the Sea, Solana Beach, Del Mar, Alta Del Mar, Rancho Santa Fe, 4S Ranch, Santaluz, La Jolla, Poway, and Rancho Bernardo. Need help in Murrieta, Wildomar, Temecula, Fallbrook or Bonsall...we're there too. Our Sonos rep stopped by the office today to see if we had experienced the Sonos PLAY5 speakers. We have heard them previously but we were intrigued by his stereo demo offer so we took a break to listen. In a nutshell, this entails using 2 of Sonos' reference speakers in stereo (just one pair of speakers). After listening to multiple tracks through these speakers, we were blown away by the bass, accuracy and imaging from this set-up. The above stereo system is fantastic but it also costs almost $4800.00. The pair of Sonos PLAY5 speakers only costs $999.98 and provides FANTASTIC sound! Interested in hearing more? Call San Diego's Sonos PLAY5 leading dealer and let us happily get you on the right path to good sound. San Diego Home Theater Installers Aire Theater Designs proudly serves all of San Diego County which includes Del Cerro, Allied Gardens, Talmadge, Kensington, Hillcrest, Mission Valley, Fashion Valley, El Cajon, Blossom Valley, La Mesa, Lake Murray, Friars, North Park, Balboa Park, Clairemont, Kearny Mesa, Mission Bay, Mission Beach, Pacific Beach, Ocean Beach, Imperial Beach, Pt Loma and Downtown San Diego. We also gladly serve those in North San Diego County which includes Carlsbad, San Marcos, Vista, Elfin Forest, Oceanside, Escondido, Encinitas, Cardiff by the Sea, Solana Beach, Del Mar, Rancho Santa Fe, 4S Ranch, Santaluz, La Jolla, Poway, and Rancho Bernardo. Need help in Murrieta, Wildomar, Temecula, Fallbrook or Bonsall...we're there too. Do you love music? The way the we enjoy music has changed over the years. Whereas we used to pop in a CD to listen to our favorite tunes, these days wireless sound systems have become all the rage. These devices allow you to control many of your favorite sources such as Pandora Internet radio, Spotify, any music that is on your phone, local AM/FM, etc. with your phone or tablet. However, there are many choices so which one should you choose? We're going to detail 2 two brands that we feel are the best you can buy. Read on for the pros and cons of Definitive Technology vs. Sonos. As we discussed in our last article, we love Black Friday because we have the day off and are lounging around with family. We don't work or shop on Black Friday and you shouldn't either! Here's another one of our "Shop Black Friday early" specials. Sonos is running a sale where you save $50.00 if you buy a bundle pack of two PLAY1 units. We are accepting pre-orders and this sale begins on 11/15/2015. Ask any member of our sales staff for details. Below is a recap of one of our earlier articles about using two Sonosii as opposed to 1. "Today I installed two Sonos Play1’s in a 10’x10’ kitchen. It sounded good as usual. With the Sonos phone app I was then able to change the two speakers to stereo and WOW...it really changed the sound by separating the music and really filled the room. I demoed some jazz and the horns and the drums seemed to come from opposite ends of the Kitchen! It sounded REALLY fantastic. The client then asked if I could put one of the speakers in another room. With the app I was able to easily remove the mode for one room (two speakers simultaneously playing in stereo) and change it to a mode that is best if you want music in two separate rooms. What a cool feature! Sonos: Easy to move, control volume and pause with app, group all or some rooms and get all the music streaming you can imagine. Sonos: Easily add more speakers like the Playbar, the Sonos SUB for BIG BASS or 3 different sizes of speakers in a good/better/best set-up. Yep, I’m a fan and will have Two Please (in Stereo)." 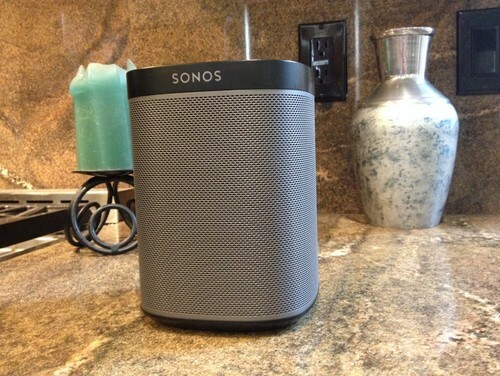 Check out our Houzz page for some more specifics on the Sonos products. Love music? We do too! Call San Diego's leading Sonos dealer and experience how Sonos can enhance your life through music and movies. What would you call two Sonos PLAY1 units? Sonoses? Sonosii? Two Sonos PLAY1s? I'm not sure what to call them aside from good sounding! Here's a couple lines from our installer Shon who just set up a couple. P.S. Sonos is running a special where you save $50.00 if you buy a bundle pack of two PLAY1 units. Ask Shon or a member of our sales staff for details. 1) Provides basically the world's best jukebox with millions of songs that can be easily accessed through your iPad, iPhone, tablet or computer. 2) Provides fantastic wireless solutions to let you listen to music anywhere in the home. See the above picture as an example...there is no way to get wires to that area for speakers. However, Sonos' wireless technologies provide an entire world of music options without the need to run wires. That little box is providing audio through the whole house. 3) It sounds GOOD! P.S. Want even BETTER sound? Step up to the slightly larger Play3 or Play5 units for bigger rooms where more fullness and bass is desired. Love music? We do too! Call San Diego's leading Sonos dealer and experience how Sonos can enhance your life through music and movies..